It’s only February, but last weeks’ markets came in like a lion and out like a lamb. The major averages finished in the “red” but significantly pared their losses towards the end of the week. The S&P 500 ended the week down .8% after falling as much as 3.7% intraday on Thursday. The Dow Jones Industrial Average fared slightly worse, closing down 1.5% for the week. The Nasdaq was the surprising outperformer finishing down only .6%. As wild as the ride was in the equity market, the commodity and bond markets were even more volatile. The benchmark ten-year yield opened the week at 1.84%, traded as low as 1.53%, and finished the week at 1.75%. West Texas Crude traded down over 15% to $26.21 per barrel before rallying to close at $29.44, a loss of only 4.7% for the week. Gold was the glaring outperformer, continuing its 2016 tear, finishing up 3.9%. It is now up over 16% on the year. Markets were highly correlated, reacting, as they have recently, to weakness in crude, skepticism regarding global economic growth, weak earnings, and the ongoing digestion of what negative interest rates signify for the global economy. Japan indices continued to take it on the chin, as the Nikkei was down over 11% on the week. Yes, 11%. Financials added to the malaise, reacting negatively to speculation that Deutsche Bank would have problems making payments on their Contingent Convertible Securities (Co-Co’s). Financial companies roared back as Jamie Dimon put his money where his mouth was and personally bought $26 million worth of JPM stock. PIMCO touted financial bonds as attractive, and Deutsche Bank signaled that they would use the recent weakness to buy back and retire their senior debt. All of these headlines helped to spur an equity rally that made index losses more palatable for the week. And it appears that this rally might have some legs. As I write, the S&P futures are up a solid 25 points, and WTI crude is up over 4% on reports that representatives from Russia and Saudi Arabia are meeting to discuss the crude market. As markets trade tick-for-tick with the price of crude, the Japanese Yen, and interest rates, often the quiet whisper of economic data is ignored. The press was quick to jump on Janet Yellen’s testimony in front of Congress and proclaim that the Federal Reserve is open to considering “negative rates.” Not making headlines was the fact that her testimony was quite reassuring in terms of the U.S. labor market, and the consumer. Also missing the front page was the fact that last week’s economic data provided a welcomed respite to the strengthening drumbeat of recession currently echoing through the hallways of hedge funds, money managers, and even economists. After a disappointing .7% preliminary GDP growth measure in Q4 2015, coupled with manufacturing surveys that have been nothing short of grotesque, many pundits have been claiming that the U.S. is already, or soon-to-be, in recession. 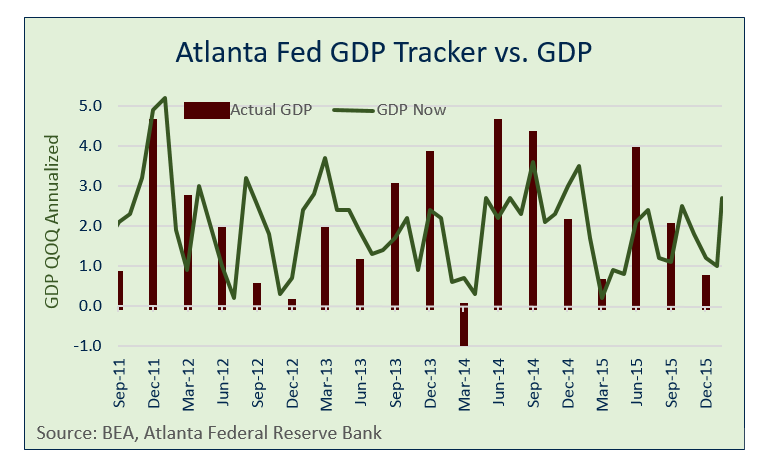 Is anyone paying attention to the fact that the Atlanta Federal Reserve is currently tracking first quarter GDP at a sultry 2.7%? The first quarter, which has been weak over the past five years, is not only positive, but it is tracking stronger than any other Q1 since the Recession. In fact, you would have to go back ten years to find a Q1 GDP number stronger than 2.7%. Of course, we are only half-way through, so we will have to wait, but it is interesting that this is getting little to no press. What else did we learn last week in terms of economic data? The JOLT’s survey indicated the second most posted job openings on record, with employers looking to fill over 5.6 million positions in December. The quit rate also increased to the highest level since 2007, indicating increasing confidence among workers. The Bears are quick to point towards announced layoffs—from Altria, Yahoo, Chevron and Deutsche Bank to name a few—as anecdotal evidence that the U.S. job market is weakening. 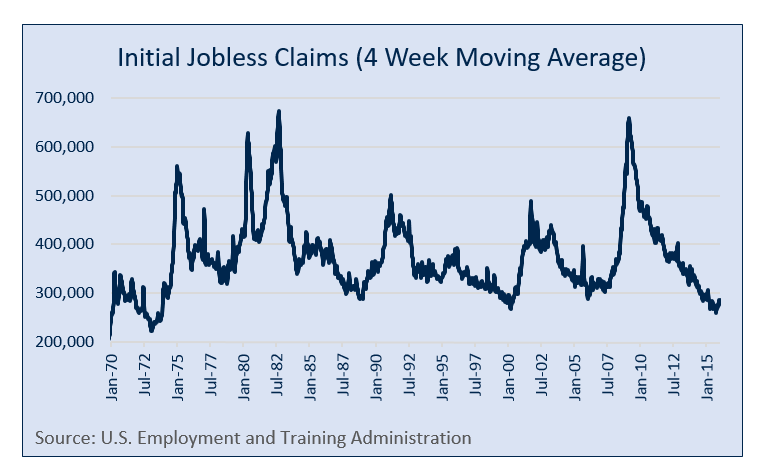 However, if the job market was really coming unhinged, would we still be seeing initial unemployment claims close to forty year lows? Probably not. The four week moving average of claims is currently at 281,000. That is up about 20k from its lows last summer. Still, prior to recessions, initial claims typically spike at least 70k, and usually eclipse the 400k mark. We are still well off of those levels. 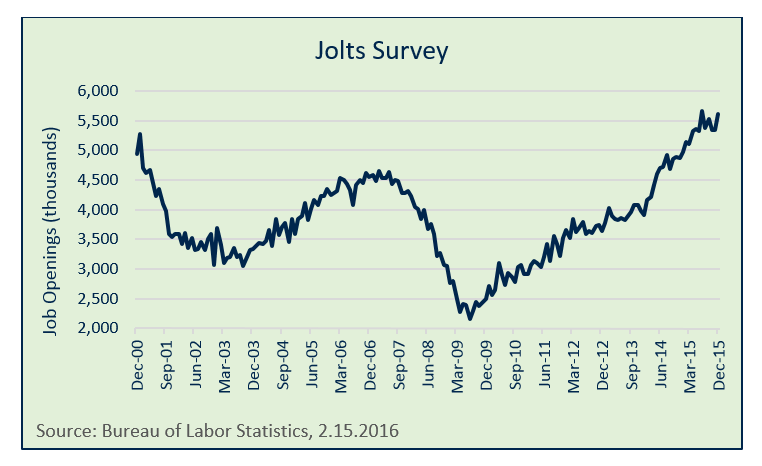 Bears will have to stick with the anecdotal evidence of a job market slowdown, because right now, that is all it is. Michigan Consumer Sentiment Survey showed continued strength on Friday as well, registering 90.7 for the month of January. The Index has now remained above 90 for the last four months, and for thirteen out of the last fourteen months. It remains to be seen if consumer sentiment will continue to hold up in the face of recent market volatility, however, it has remained strong thus far. It is off about six points from its high last January, however, prior to recessions this indicator typically falls at least twenty points. We are far from that, and as the chart below indicates, still in an uptrend. The consumer’s spending habits seem to be supporting survey results. 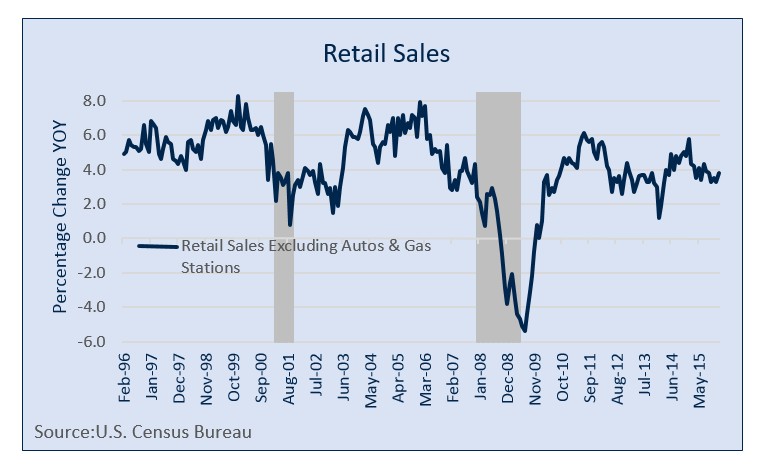 Advance retail sales came in stronger than consensus on Friday, and weak December data was revised higher. The ex-auto and gas number registered a .4% gain month-over-month and is 3.8% higher year-over-year. Strength in this data series is positive for the economy, but it is more of a coincident indicator as illustrated in the below chart. In spite of the encouraging economic data last week, there is still reason to worry. Not all of our trusty recession indicators are signaling the coast is clear. High yield spreads have now widened 450 bps from their lows. They have never widened 450 bps without the economy going into recession. One caveat– we only have data for two recessions. Still, such a move is signaling something is amiss. Much of the move is energy related, and it is well-documented that much of the energy complex in the United States is already in recession. 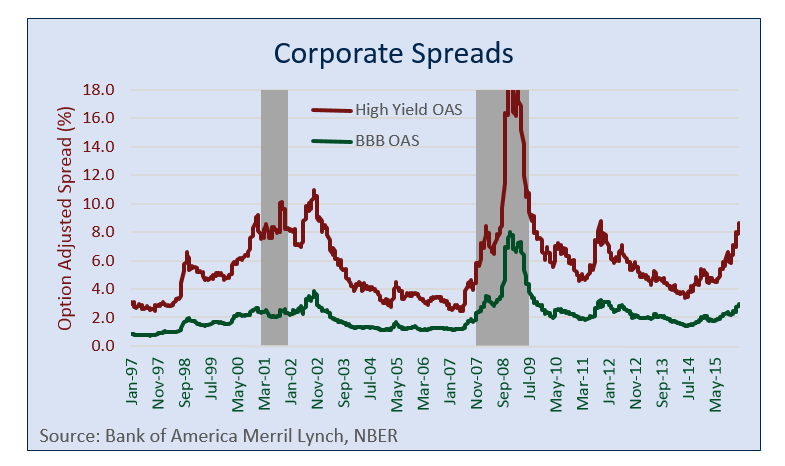 If high yield spreads predict recession in 2016 remains to be seen, however, they are already trading at levels realized in the 2001 recession, so regardless, we see value in high yield. As an indicator for the economy and the rest of the market, however, this shouldn’t be ignored. The ISM Manufacturing (as well as a number of regional manufacturing surveys) has been weak in the face of the capex slump emanating from the energy sector, as well as a stronger dollar that is curbing demand from abroad. It has now registered a sub-fifty reading in each of the last four months. 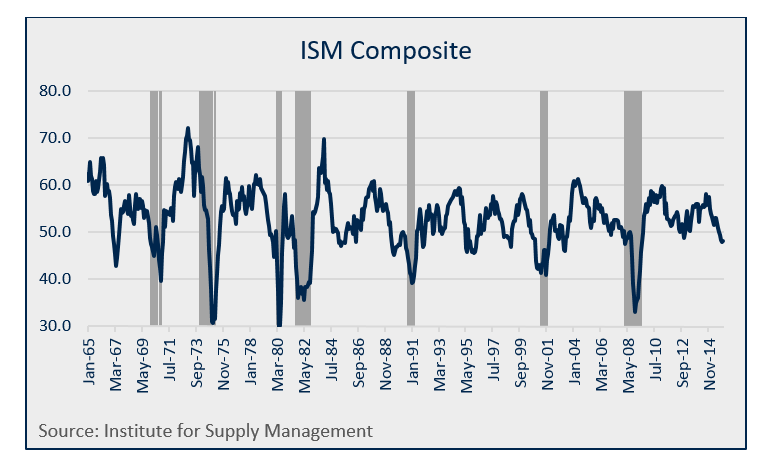 Every recession since 1965, with the exception of the first oil shock of the early 1970’s, has been preceded by a sub-fifty ISM manufacturing survey. Although, a sub-fifty reading does not always signal recession. There are at least seven times on the below chart where the survey breaches the 50 level and recession does not ensue for at least three years. As manufacturing has garnered less of a share of GDP (currently 12%), this survey is not as important as it once was. However, weakness in manufacturing is certainly something to keep an eye on, and further weakness would not bode well for the economy. A reading below 45 would certainly portend a recession, or at least history would support that notion. The final indicator that is worrisome, is the recent rally in the ten-year treasury yield. The yield fell 75 bps since the beginning of the year to its low of 1.53% last Thursday, before closing the week at 1.75%. Prior to the last three recessions, the ten-year yield has declined at least 100 bps from its recent highs. We are not there yet, but yields, until Thursday of last week, have been decisively moving one way—lower. 1. 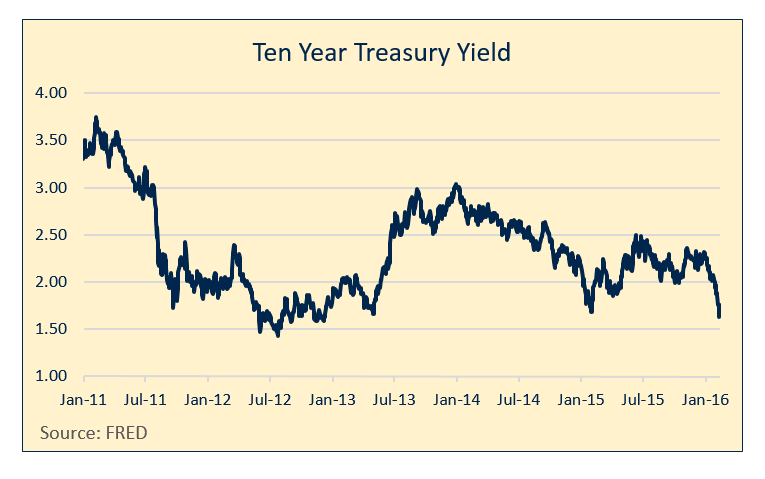 Inverted Yield Curve –NO RECESSION– Although the yield curve has been flattening for the better portion of the last year, the spread between 10 and 2 year treasuries is still 105 bps, well above its historical average and nowhere close to inverted. 2. Leading Economic Indicators Turn Negative year-over-year—NO RECESSION–The LEI index has turned lower, year-over-year, but is still up 2.7%. The next reading is February 18th. 3. High Yield Spreads Widen at least 350 basis points—RECESSION–High Yield spreads have widened since 2014 by about 450 bps, due mostly to the commodity slump. 4. 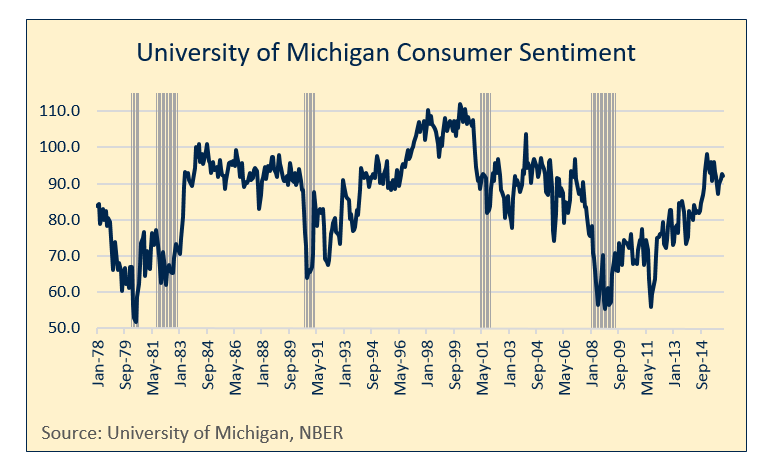 Michigan Consumer Sentiment drops at least 20 points from its highs—NO RECESSION–While not at its highs, the Index is only 6 points below its high registered in January 2015. 6. ISM Index below 50—RECESSION–This index has spent four months below 50, signaling contraction in the manufacturing sector. A reading below 45 would signal recession. 7. 10 Year Treasury Yield Rallies over 100 basis points—NO RECESSION–The ten-year treasury is about 45 bps off its high water mark at the beginning of 2016. Last week, underneath the choppy surface market volatility, there was a strong tide of economic data, suggesting that the U.S. economy will avert recession, at least in 2016. The job market continues to be strong, and the consumer is still confident and spending. These are the two most important aspects for a bullish thesis, since they are the linchpin of the U.S. economy. On the flip side, manufacturing surveys continue to be weak, and a dip below 45 on the ISM survey might change my outlook. High yield spreads offer value in terms of an investment, but continued widening, especially outside the energy sector, would also give me cause to reconsider my economic outlook. And finally, a break to all-time lows on the ten-year treasury yield would be cause for concern. All of this considered, fundamentally, I think that the recovery is intact, and that the consumer, given the strength of the labor market, will continue to spend and put the U.S. economy on its back. Macro-economic data, will start to surprise to the upside, both globally and in the United States. Meanwhile, there is a preponderance of negativity and bearishness that could very well provide the fuel for a sustainable rally. I think that the lows for the year are in for the major U.S. equity indices, and we have seen the low yield for the ten-year treasury. I don’t feel comfortable calling a bottom in crude, although if I was forced to choose, I would prefer to be long at this point.